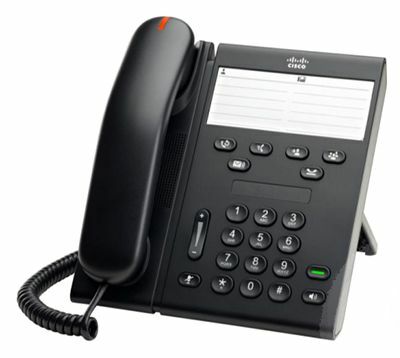 The Cisco 6911 IP Phone is a single-line endpoint delivering affordable access to Cisco voice communication services. It is an ideal solution for light communication requirements. Examples include classrooms, manufacturing floors, or employees in cubicles or teleworking from home. The Cisco 6911 IP Telephone supports two incoming calls with a single-line endpoint. A full-duplex speakerphone is included in the design, which provides a more productive, flexible, and easier-to-use endpoint experience. Integrated IEEE 10/100 Ethernet switch ports support connection to a co-located PC while reducing cabling infrastructure and administration costs. The Cisco Unified IP Phone 6911 includes fixed keys for hold, transfer, conference, redial, and voicemail, making the phone simple and easy-to-use. In addition, a programmable feature key is supported for quick access to advanced communication services. Tri-color LED illuminates on the line key to provide quick call-state indication at a glance. The Cisco 6911 IP Phone offers personalization, with the choice of two colors (charcoal black and arctic white). This Unified IP telephone is also eco-friendly, taking advantage of reground and recyclable plastics to deliver a more earth-responsible solution.